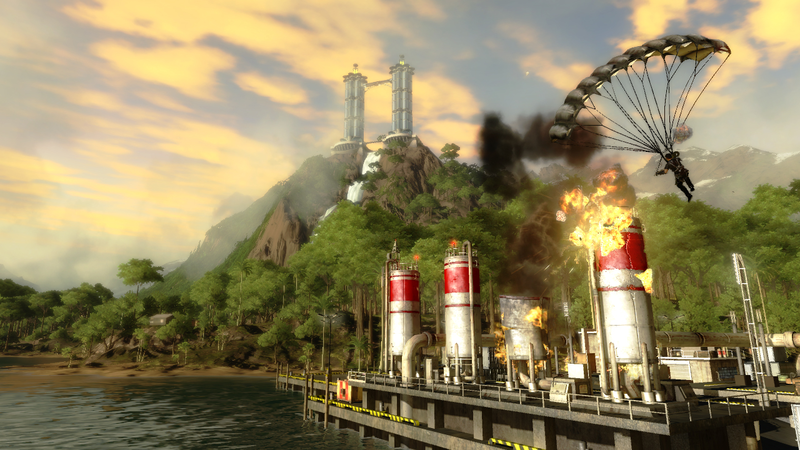 Just Cause 2 is a game that some might be skeptical of at first. For me, the first Just Cause was nothing but the staple game of the bargain box at the local Hastings. 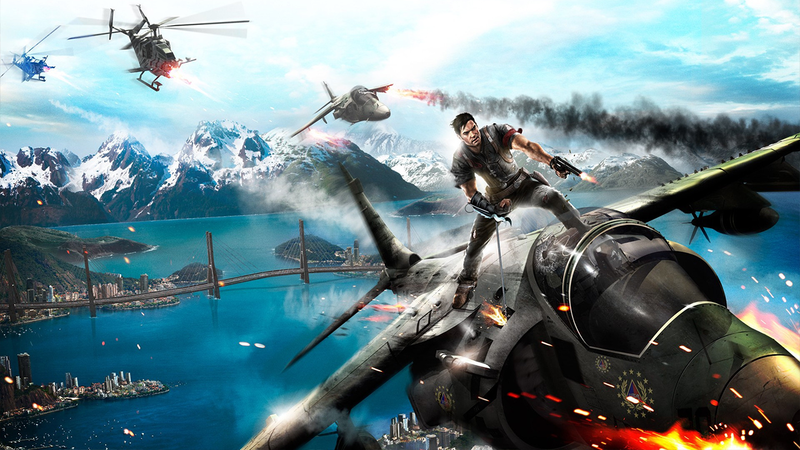 However, all it takes is the demo of Just Cause 2 to show you that this game is far from bargain-basement. 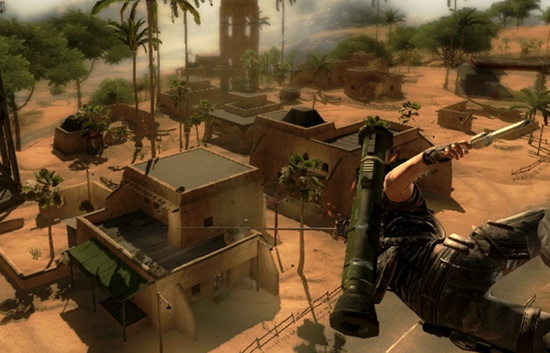 Just Cause 2 puts you in the shoes of Taquito Vengeanceface, as he continues his quest to destroy anything and everything belonging to the Texaco corporation. OK, so I have no idea who the main character is beyond “Rico Rodriguez, Agent of Whatever”, or what the plot involves, but the beauty of Just Cause 2 is that you don’t have to follow the story missions to have fun. I’ve just been flying around, finding settlements, skydiving into them, and freedomizing them via spontaneous combustion. The story itself is pretty generic, involving Rico looking for one of his comrades that he fears has “gone rogue”, all the while trying to avoid getting captured by the dictator of Panau, Baby Panay. If the first Just Cause’s setting was a thinly veiled Cuba, then this game’s location is a thinly veiled North Korea, complete with a short, fat dictator who rose to power by deposing his father. The gameplay is where Just Cause 2 really shines. Rico controls similarly to other sandbox game characters, so anyone who is familiar with Saints Row 2 or GTAIV will be able to jump right in. The innovation comes in with the addition of 2 items: the grappling hook, and the parachute. The grappling hook can be used to pull enemies towards you, grapple parts of the environment and reel yourself towards them, or hook two things together (this comes in most handy when pulling down statues or in a chase sequence). The parachute can be deployed at any time your character has sufficient speed, and can be redeployed infinitely. When used in conjunction, these 2 items give our hero the capability to launch himself forward, glide using the parachute, and quickly change direction via what the game calls the “slingshot maneuver”. Rico can also stunt jump onto vehicles, and hang off of various spots on them in order to avoid enemy fire. The Island of Panau gives you many things to destroy, from fuel depots to military bases. Blowing things up is very satisfying, and looks impressive, as does just flying over the island. Everything is crisp and bright, and looks great on an HD set. My complaints are few and far between, but one of the major issues that I’ve found is the occasional grappling hook glitch. Sometimes, the hook won’t grab onto what it’s aiming at, which either will mildly annoy you or get you killed depending on the situation. This issue will probably be ironed out with a patch. The other major issue I have is with the black market dealer. Some have complained that his prices are unreasonable, but honestly I haven’t run out of cash once. What is annoying is that there is no garage in the game, which means that the plane you just spent $35000 on will be rendered useless when you crash it, lose it, or quit the game and reload. Another annoyance about the black market dealer is that every time he shows up, you have to watch his landing animation, buy one item, and then watch him leave. For every item you need. Every time. God forbid you need a pistol AND grenades, lest you waste 10 minutes between the animation and the loading. Again, this issue can be ironed out with a quick patch, and I wouldn’t be surprised if the garage showed up as DLC later (although I wouldn’t be too happy about it). In closing, Just Cause 2 is a good investment for anyone looking to blow something up. Does it have as much storyline depth as GTAIV? No. Does it have as much to do as Saints Row 2 (my gold-standard for sandbox games)? No. But it does have felony destruction of property. Besides, how many chances do you get to ruin the infrastructure of an entire country for years to come? Score: 8 out of 10 Exploding Gas Pipelines.